The head cinta (xk´ap) from Santiago has been immortalized on the choka, the Guatemalan 25 cent piece. It is only worn now by some older women, on special occasions. Most younger people prefer simpler barrettes, either Chinese plastic ones brought from the capital or, especially more recently, beaded ones. Early cintas were much smaller (narrower and shorter) than modern-day ones, hanging out about one inch from the head. They were unpatterned, mainly green, magenta, orange and purple with a red central section, woven of cotton or, for rich people, a shiny rayon or silk. Gradually they became wider and longer (hanging out further) and began to be decorated with tapestry designs, more or less in the same colors, ultimately resulting in the modern hair wrap, a beautiful disc-like saucer affair, slanted upwards, that hangs some 4 to 5 inches from the head. Women's tzutes are usually worn draped over one shoulder. A distinction is kept between the longer style used before, which is called properly a su´t, and the shorter, almost entirely ornamental style favored today, called a perraje. First for carrying children or market produce, shawls turned into style, or a definition of marital status, the long tzute giving way to the fashionable, almost functionless young women's perrajes. Originally the word used for a shorter cloth woven to swaddle or wrap a baby, this last style has been a development of the last twenty years. Today most use a sort of compromise for carrying things. The typical old style (from the earlier part of the last century), which is still woven and used by a few, having experienced a revival among some women, has red and black lengthwise stripes interspersed with narrower ones of mauve. In the first quarter of the century, these stripes were probably more commonly of brown cotton and indigo: some later examples would retain a few stripes of xcacoj or a commercially dyed brown substitute. These earliest ones were usually fringed on one side only, but eventually tzutes were knotted on both ends.Block jaspe began to be used, probably at the same time it first appeared in other things. By the 1970´s, a whole spectrum of bright colors were being used in both stripes and in the jaspe, and though the block jaspe persisted, other, more intricate designs were being used along with it. Fluorescent nylon threads came into style, and large brilliantly colored pompoms(?) were sewn at the corners of the shawl. Glitter also came into fashion, peaking with some tzutes that were woven entirely out of it. The jaspe designs (no longer of indigo), became smaller and more complicated, and eventually took over the perrajes completely in the late 80´s and early 90´s. This is more or less the style now. More somber colored and understated, modern perrajes have only narrow colored stripes between the jaspe, if at all. The jaspe is multicolored and glitter is a standard material. There is also another type of traditional women's tzute (capraj su´t), which is used by cofradia women exclusively as a head cloth for ceremonial occasions. 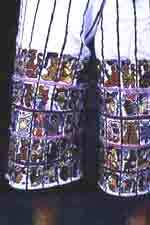 It is selvedged on one end and knotted on the other, woven with narrow, mostly xcacoj and indigo stripes, separated by narrow ones of white, which is probably very much what the earliest su´t were like. 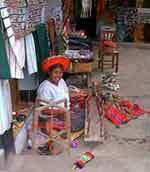 Though compared to some other towns in the highlands, the men's traje of Santiago Atitlán has persisted, today nearly a third of the men and boys wear western clothes. This is due to a number of processes of cultural change, such globalization and growing evangelism, but a large factor is economics: it is expensive to dress in traje, and in comparison a pair of pants and a shirt from the paca Americana is very cheap. Men's pants (scaf) are made of the same fabric as the huipiles and have had more or less the same development, though much more conservative. At the turn of the century the scaf, with widely spaced narrow red stripes, were worn wide and hitched up at the side, barely covering the top of the knee. They lengthened in the 30´s to cover the knee and became even narrower (today most come just below the knee, but some come all the way halfway down the calf). Some were embroidered with figures and the mock-brocade, and as on the huipils of the period, the stripes on the pants were purple, red, and orange, more closely spaced and gradually becoming wider (later the orange and then the red disappeared). Cuxaq has rarely, if ever, been used. Not all pants were embroidered, and today it is as usual to see elaborately decorated scaf covered with birds as completely plain ones. Men's sashes at first were mostly red, some with stripes of indigo or mauve, and they were knotted only at one end. Somewhere around 1950 they began to be decorated with jaspe stripes (probably with influence from San Pedro La Laguna), following in the vein of women's tzutes, and gradually the traditional colors disappeared. Since the 40´s it has been common for men to wear factory made shirts with their scaf, and this situation has been accelerated in the last 15 years with the arrival of the global economy. The occasional boy or old man can still be seen in the town wearing the traditional shirt in Santiago, made of a red and black striped fabric, backstrap woven but with a European cut, though it is more usual to wear the shirts for special occasions. The earliest men's shirts, from the turn of the century, were white, before the first pre-dyed threads came available to Atitlán weavers. Later the wealthy men's shirts acquired the stripes, of dark colors (indigo and red before the arrival of black thread), which, as still more or less customary, were 4 warps wide. It was traditional for the buttons to come halfway down the chest, though later the shirts became more conventional and buttoned all the way down. Some also came to be made with block jaspe (San Pedro style), which today are still used as well by some of the more well off. Hats have been used in Santiago a long time, and at one point they were an indispensable part of every man and boy's traje. Before they were introduced, however, men wore head tzutes, the only remnant now being the special tzute worn by men in the cofradia. This was woven traditionally of x´cacoj, with stripes of red and mauve, handspun, and the cloth has an important spiritual and geographic significance (for further info, see Carlsen and Prechtel, ¨Weaving and cosmos amongst the Tzutujil Maya of Guatemala. ¨). In the time that all men wore a tzute, there is some indication that the way it was worn was age or experience graded: old men and powerful ones wore the su´t on their heads, middle aged men around their neck, and young men and boys wrapped around the waist. During the 30´s, it was worn either under or around hats. Today, again, men's tzutes are solely the province of the cofradias, and men wear all sorts of headgear (cowboy hats, boleros, baseball caps, etc), though they are not, as in previous years, essential.